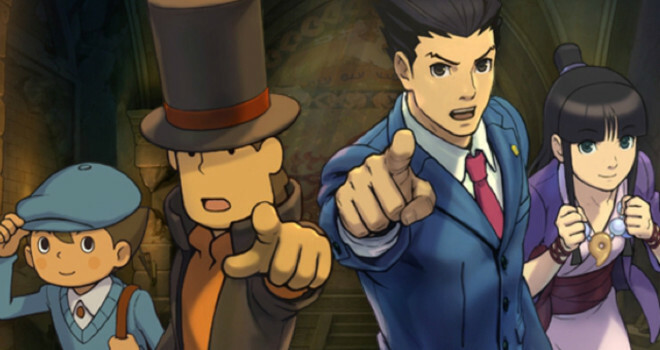 The thing that has everyone talking right now is the long awaited North American release of Professor Layton vs. Phoenix Wright: Ace Attorney on the 3DS, but there have been quite a few other updates for the 3DS. and Wii U.
Azure Striker Gunvoit, a game that draws heavy inspiration from Mega Man X, hit the 3DS eshop. The game also includes a Mighty No. 9 mini game crossover. In addition, Mega Man X3 came to the Wii U shop, giving fans of the Blue Bomber a nice treat. Also, the popular SteamWorld Dig made it’s way from portable to home console in it’s jump to the Wii U. Professor Layton vs. Phoenix Wright: Ace Attorney – Join forces with expert investigator Professor Layton and ace attorney Phoenix Wright in this unbelievable crossover adventure. Find out what new twists they bring to the courtroom as they solve puzzles and debunk witnesses’ lies. Cross-examine multiple witnesses at the same time to uncover the mysteries of the magical city of Labyrinthia. Professor Layton vs. Phoenix Wright: Ace Attorney will be available in the Nintendo eShop on Nintendo 3DS at midnight ET on Aug. 29. Azure Striker GUNVOLT – From Inti Creates and featuring the talents of Keiji Inafune, the creator of the Mega Man series, Azure Striker GUNVOLT takes the best aspects of Japanese 16-bit classics and updates them with new play mechanics and slick graphics. For a limited time, the game comes with a free digital code to download the 8-bit nostalgia-fueled MIGHTY GUNVOLT as well. Azure Striker GUNVOLT will be available in the Nintendo eShop on Nintendo 3DS on Aug. 29. Thorium Wars: Attack of the Skyfighter – Pilot one of three Skyfighters across alien worlds to protect Earth. Push your dogfighting skills to their limits in this futuristic 3D aerial shooter, available exclusively in the Nintendo eShop on Nintendo 3DS. Click here to watch a trailer for the game. Mega Man X3 – Every Thursday in August, Nintendo and Capcom are bringing classic Mega Man games to the Virtual Console service in the Nintendo eShop on Wii U. Mega Man X and his partner, Zero, must discover why an antivirus has failed to turn robots from destructive Mavericks into peace-loving Reploids. Run, jump, dash, scale walls, avoid obstacles and fight enemies in eight challenging stages as you hunt for the latest cure. SteamWorld Dig – After its positive reception on Nintendo 3DS, indie hit SteamWorld Dig is making its way to Wii U for the first time. In this platform mining adventure, take on the role of Rusty as he arrives at an old mining town in great need. Explore an underground world full of secrets, treasure and terrors with interface elements that use the Wii U GamePad controller. Click here to watch a trailer for the game. The Fall – Explore an alien world in this unique blend of action game play and adventure-game puzzles in The Fall, which launched Aug. 26. Take on the role of ARID, the artificial intelligence within a high-tech combat suit, as you struggle to save the suit’s unconscious human occupant. Get ready for a disturbing and engrossing journey as you explore the world of The Fall. Click here to watch a trailer for the game. Tom Clancy’s Splinter Cell Blacklist – is being reduced to $19.99 (from $39.99) starting Sept. 1 on Wii U.